CORTE DEI MIRACOLI is another Italian great that falls into the realm of traditional, keyboard-based symphonic. The band creates a sound fairly similar to BANCO, sometimes heavy, sometimes lighter, usually lyrical, always in the symphonic vein. The music is moderately complex and all members are good on their instruments. The first incredible recordings from this famous band elaborated tracks with symphonic keyboards and great mixture of progressive elements that combines certain aspects of GENESIS, VDGG and PFM. 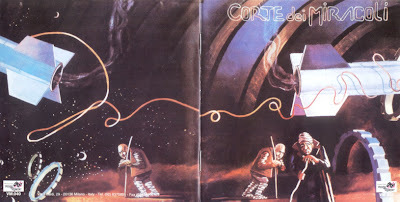 Corte dei Miracoli's self-titled album has a distinct symphonic prog sound being very melodic and contrasting in writing style with fellow Italians BALLETTO DI BRONZO, BIGLIETTO PER L'INFERNO or CAMPO DI MARTE. This is purely Italian progressive rock at its best. Pleasant albums after all!! !